Yes, on March 13th 2011 Puzzlemad was born! It does seem longer than that! It feels like I've been writing about this stuff forever. I have had a hell of a journey over the last 2 years. I started puzzling nearly a year before I began blogging and in that short period of time I have managed to accumulate over 570 puzzles, solve most of them (there is a moderate queue waiting to be solved) and make a huge number of friends from all over the world. I even get to meet a few of them fairly regularly at our Midlands puzzle parties - all welcome! The topic today is not a review of a particular puzzle but a list of my top 5ish puzzles of all time from my collection. Believe me, this is a really hard set to choose and any designers and craftsmen out there who might be miffed because I didn't include you, don't be! My top 20 or 30 puzzles all came out pretty close to each other. You will all be aware by now that I have developed a major major twisty puzzle habit! 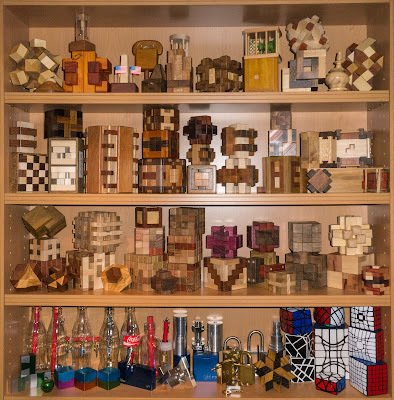 They aren't classically beautiful to look at like my wooden and metal puzzles but the design skills that goes into their manufacture is tremendous and they provide a fantastic puzzling experience. They are even forming pride of place on my main shelves. 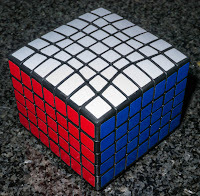 You don't need to memorise millions of moves (unless you are a speedcuber) all that is needed is a basic understanding and the ability to think and apply basic techniques to more and more difficult puzzles. The above 4 are probably my favourite twisties of all time - they are hand made or printed plastic puzzles and have kept me occupied for many hours. They were reviewed as part of my cuboid classification which I published here. Not for the beginner but not too much of a jump to get to them. I have been twistying for only a year now! Go on you know you want to!!! How could my top 5 possibly not include this set of puzzles? These are where it all began! Quite a few years ago Chris Pitt showed me the blue and green revomazes at a Gadget show live and some months later the decent into madness began! I adore most of these puzzles - the quality is superb and the puzzling experience is a dream, although the pain in my hands has been fairly awful at times! So not all of them? No! The final one in the series just a combination lock with cryptic clues! I have opened it but my experience was not what I wanted. For me the real pleasure came from two of the dynamic mazes (dynamic in that the path changes as you move through) - the bronze and the orange were the most marvellous puzzling experiences. They provided 100s of hours of pleasure and look fantastic on the shelf. Why not the silver? 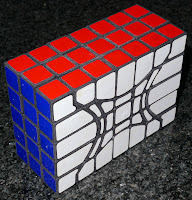 I can only shudder whilst recalling the terrible pain and angst of solving it!!! Even to this day only 54 people are members of the Silver revomaze open forum. It is just too difficult to be in my top 5 puzzles. Why aren't they taking pride of place in the top photo? Because those shelves are 2' above my desk and if a cat jumps up and knocks them off then my desk is a gonner! I reviewed this last October here. It was bought as part of a batch from my very good friend Bernhard Schweitzer who runs the Puzzlewood store. 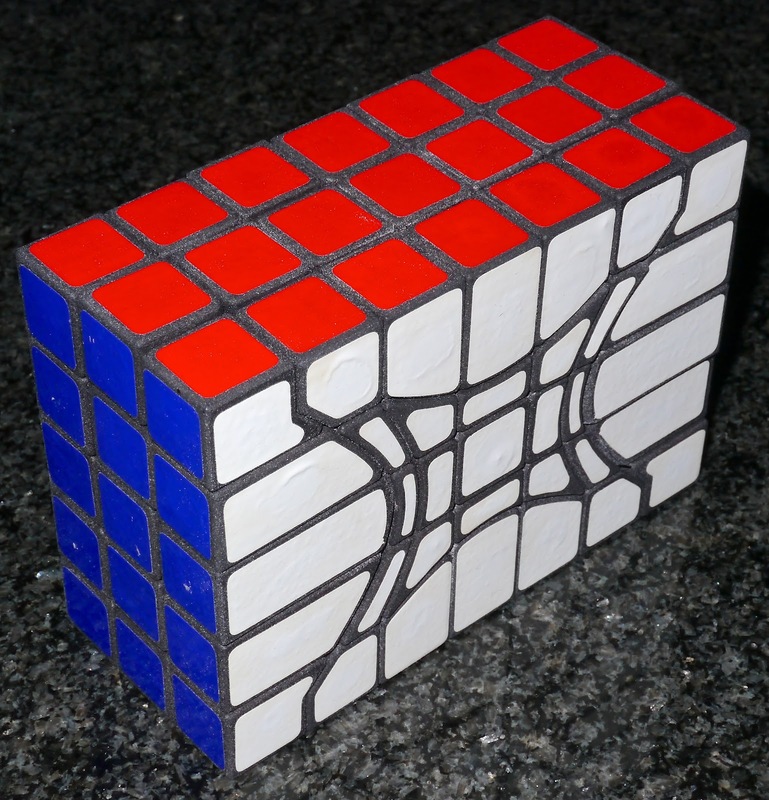 He is probably the world's foremost authority on interlocking cubes and has even published an article on this subject in the last edition of the Cubism for Fun journal (this is the journal of the Dutch Cube Club and always makes a fascinating read. He himself extolled the virtues of this particular set to me when it came in stock and I could not resist it. He was not wrong - there are several puzzles to be done and it can be very challenging. Beautifully made with a lovely box, I still find myself going back to the shelf and taking it for a fiddle. I am not sure whether Bernhard has any more but if he does then get them - you won't be disappointed. I can't believe that I announced my purchase but have not reviewed this puzzle yet! I bought this quite early on in my puzzling odyssey and just clicked the buy button quickly and felt sick for some time afterwards!! 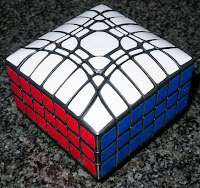 It was my first seriously expensive handmade puzzle and to be honest wasn't that bad but it was the first time for me. I am very glad that I did click to buy because it has provided many many hours of fun and is just so beautifully made. The maze burr was an original design by Kagen Schaefer and has been improved by Tom Lensch who made this particular copy. It consists of a cube with faces made of maze plates through which a maze pin is pushed. The plates block each other until they are slid out of the way. Obviously a certain sequence of moves is required to move the plates around the central pins and finally take one of the plates off. 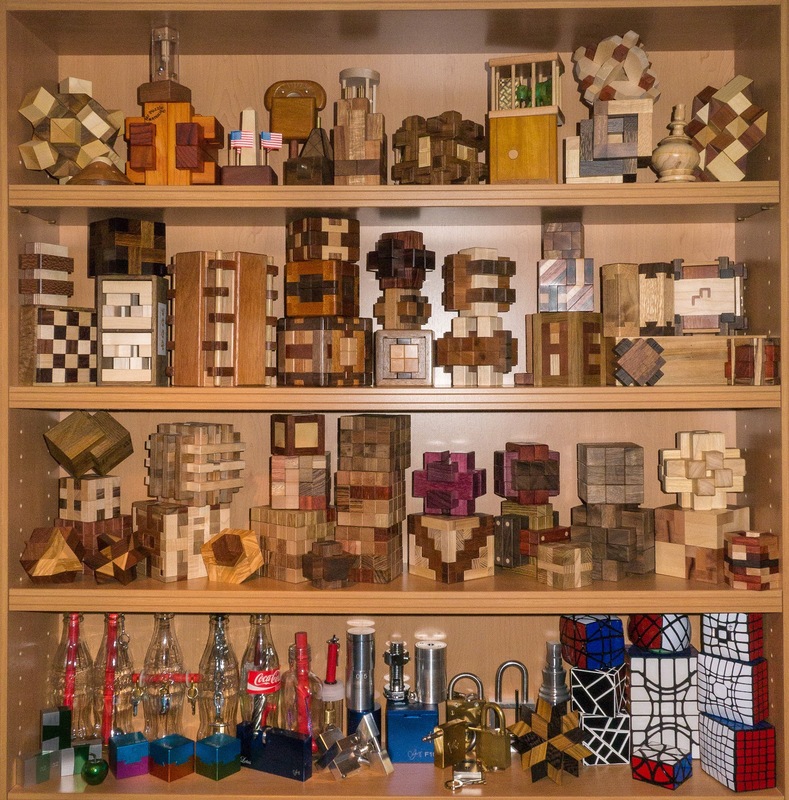 It is possible to create many many 1000's of different burr puzzles including one that takes 116 moves to open! After some liaising with one of the doyen's of puzzling, John Rausch who had used a self designed piece of software to fully analyse it these, I had a DVD containing several 100,000 problems which could be done. I used some Unix terminal-foo to produce a sereis of more manageable text files and distributed them to the others who had bought this puzzle. I love it! 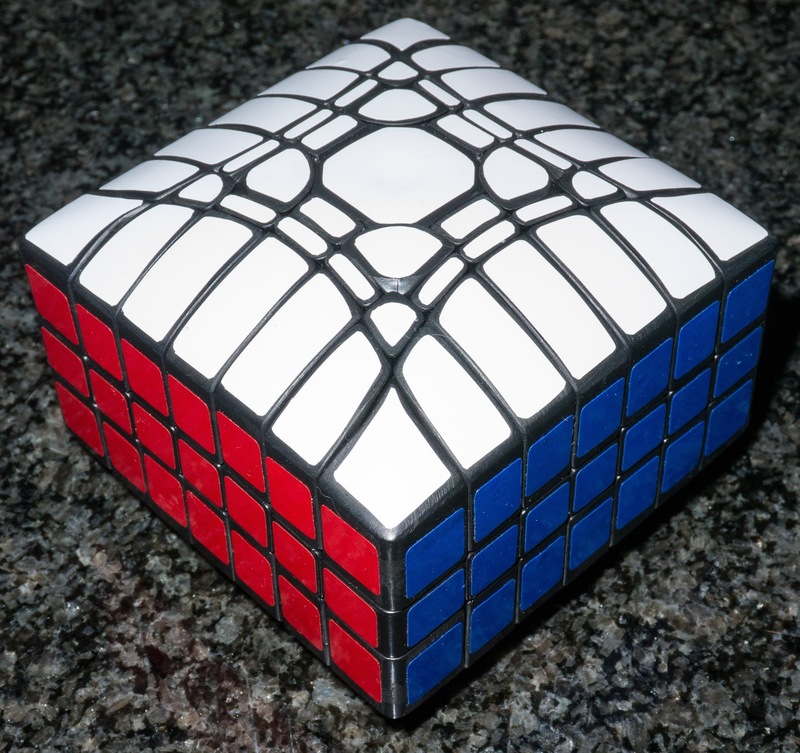 I cannot wait to get a new and probably even harder version based on a rhombic dodecahedron from my friend Derek Bosch who is currently designing this for future sale. Neil showed this off here complete with video. This magnificent beast came from Jerry McFarland (yes another fine craftsman I am pleased to call a friend). He entered this into the IPP design competition last year and I could not review it until afterwards and it has subsequently remained in my list of puzzles to write about. Luckily it is not too urgent because Allard reviewed it here. It is a huge puzzle and consists of rather a lot of pieces - 37! They all interlock into something staggeringly beautiful and shockingly difficult to open. It took me about an hour to work out the trick to the first section which is to remove the central 4 Maple sticks. It requires some tricky lock-picking techniques to do it (hence it took me a while!) and then unlike most other burrs the frame doesn't just fall apart - it remains mysteriously solid and is even harder to fathom than the initial section. Even more difficult lock-picking is required before you end up with a rather large pile of sticks. No I didn't do what Allard did and mix them all up! Quite a lot of pieces! Spot the beautiful ebony block. Fully solved! There's a lot more pieces!!! I hope you have enjoyed this small list of my very best puzzles on my birthday. There are many many more puzzles that I haven't listed but which also made for really fantastic puzzling. Hopefully I'll keep this up for another year - it's a huge amount of work but very rewarding! Wow! "Happy 2nd Anniversary" Kevin... Here's to many more years of happy puzzling and blogging! Thanks Jerry!! My that was a quick response! 4 minutes after I posted it!! I will hopefully keep on going for many more years! Not yet! Will work on that or send you photos of the pieces to let you do it. It would be a fairly complex model!! But you are the master of those!!! I plan on going on forever! I'm having far too much fun to give it up! In fact usually this much fun means you are doing something illegal! Well done Kev and I agree with most of your choices. Changing partners is ignored by many but I love it too! Great! More people should listen to us! We ARE pundits!! And have you looked at the total amount spent? It's enough to cause a cardiac arrest!!! I'll so my very best mate to keep up with you! Congratulations Kevin! Keep it up, it's a great blog, I'm having a lot of fun reading it! Almost as much fun as I have writing it! I love hearing about your ever expanding collection too! Nice article as always Kevin! I'm curious about the revomazes, they look interesting and I'm sure i would find them a lot of fun, but you talk about hand pains. I suffer quite severe hand pains anyway, so I suspect they wouldn't be good for me, but are you having to grip them quite strongly to turn them? They are hard on the hands Marty! Not because they are tough to turn but because they require pinpoint accuracy. This requires a firm grip and a very accurate control. Even a half millimetre can be the difference between success and failure. You're planning on coming to the next MPP so drop me a reminder and I or someone will bring a selection for you to try. I can't even imagine what your collection will look like in another two years time. Thank you Gabriel. There's no real organisation to it at all, I have just sort of stuffed the nice stuff on some shelves above my desk! In another 2 years it will look much the same as I'm now running outbid space and "she" won't let me have any more!